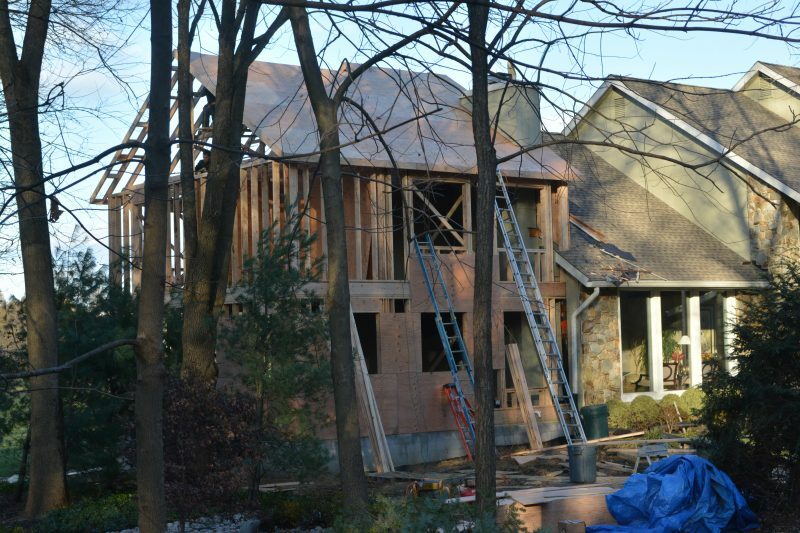 Movin’ Right Along – Second Floor Framing in Moorestown | R. Craig Lord Construction Co.
R. Craig Lord Construction’s two-story addition is moving along at a steady pace in Moorestown, NJ as the second floor and roof is framed. 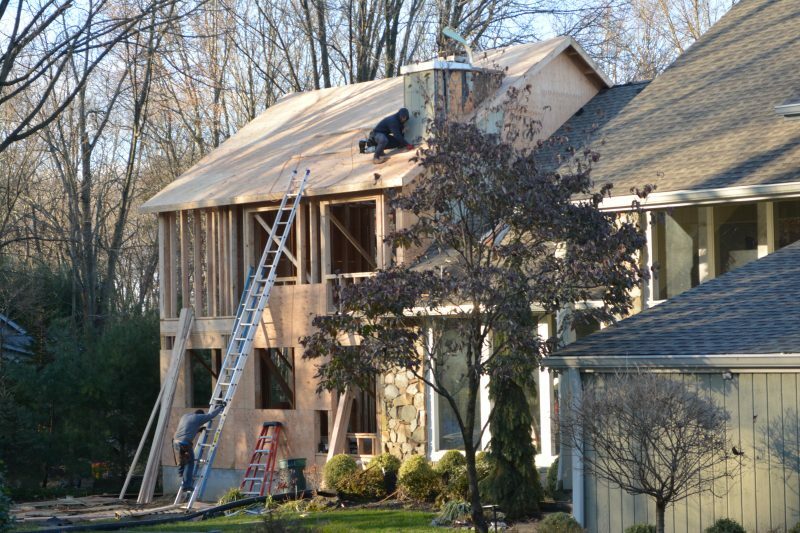 This is an exciting time in an Addition project as the form of the Addition takes shape and the homeowners can see, in person, the new front elevation of their expanded home. To create the second floor, a metal beam was added to the ceiling of the first floor to provide support for the weight of the additional floor and roof. Then the floor was constructed and walls were built onsite and raised to position. The gable roof was constructed and the chimney extension framed out. In the below photos, notice how the pitch of the new roofline mirrors the existing roofline. A roof provides protection from the elements and precipitation, helps drain water away from a structure, and provides insulation that helps keep the interior of a building warm or cool, depending on the season. 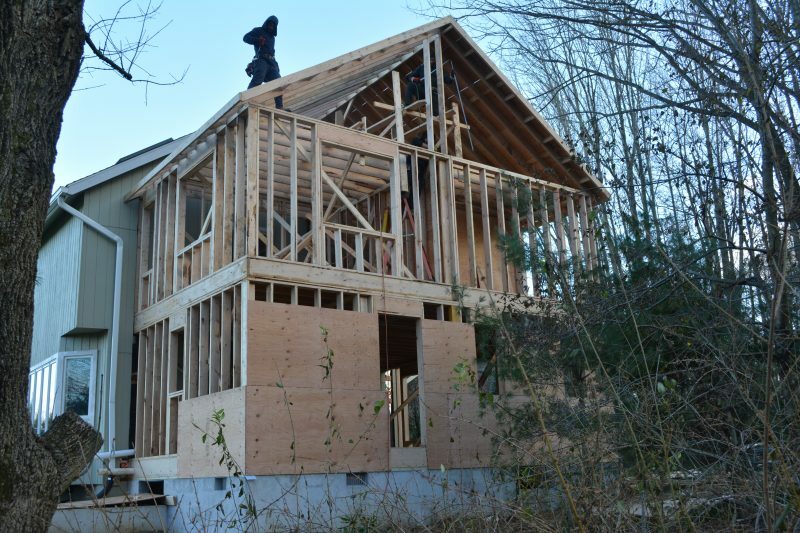 The team at R. Craig Lord Construction built the roof structure on-site and after the rafters were anchored, sheathing was installed over the rafters. 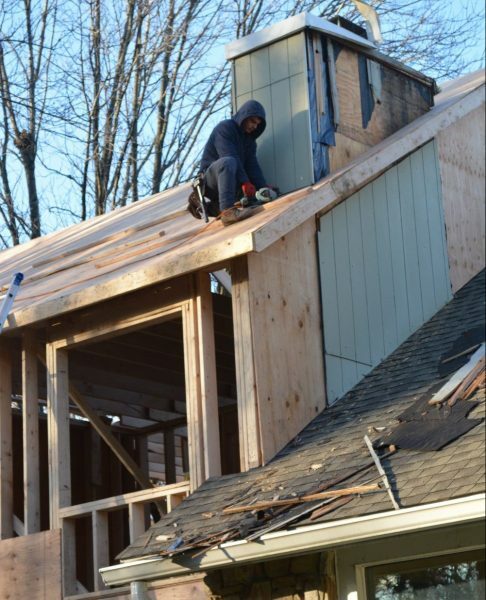 A drip edge will be added to added at the bottom of the sheathing to protect it from rain and direct the water into a gutter. For more behind-the-scenes of this Riverton Road, Moorestown two-story addition, visit these earlier blogs. And feel free to contact us at (856) 235-4237 or at www.rcraiglord.com/contact to discuss your remodeling needs whether it be a Kitchen, Bath, Sunroom, Porch, Deck, Addition, or a wholehouse remodel.